When the Dunhill Duke Street shop was opened in 1907, it wasn't a pipe shop. You couldn't even really call it a tobacco shop, in our modern sense. It was, effectively, the office of a bespoke blender, and the main components of that business were components themselves, as in component tobaccos, plus a book - the My Mixture Book. It was there that visitors and regulars to the Dunhill shop had their custom-fitted blends recorded, noted, and numbered, some 36,700 of them by the close of the 20th century. Early on Alfred Dunhill realized his bespoke-blender model of business placed some serious, inherent restraints on long-term growth, and that he was going to have his work cut out moving towards something really big. So he started moving towards it right away. As early as 1912 Alfred Dunhill began producing catalogs which featured pre-tinned blends chosen for wide appeal, rather than being custom-tailored - though some of those earliest were, in fact, derived from "My Mixtures", 965 included. My Mixture blends thought to have a general appeal had, in fact, already appeared in the very first Dunhill catalog, two years previous. Joining them in 1912 came two names we find alive and well once more today: Durbar, and Royal Yacht. 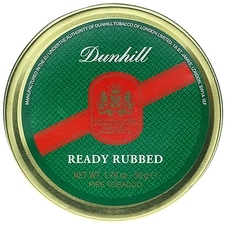 It was the WWI period that ushered in Dunhill's first use of air-tight, fully sealed packaging, in the form of the cutter-top tin introduced for the "Campaign Mixture" in 1916. This would become an important improvement post-war, as Dunhill blends found appeal in markets far from the British isles - such as across the Atlantic. The US, of course, remains to this day a very important market for Dunhill, as American pipe smokers have reacted to the reintroduction of one storied old Dunhill blend after another with unflagging enthusiasm.